212 pages | 20 B/W Illus. New technologies are dramatically changing the face of education and the nature of childhood itself. 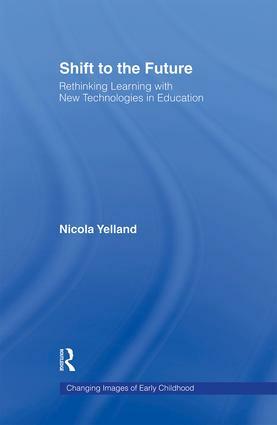 In Shift to the Future, Nicola Yelland examines the ways in which these technologies are reshaping the social, personal, and educational experiences of childhood, and explores the curricular revisions such changes demand. With a focus on the various information and communications technologies (ICTs) available to young students and the possibilities these ICTs offer for teaching and learning, Shift to the Future provides inspiring examples of teachers who have innovatively incorporated new technologies into their classrooms to engage their students in contemporary times. Nicola Yelland is Professor of Education in the School of Education at Victoria University in Melbourne, Australia. She is series editor of Routledge's Changing Images of Early Childhood series. Books in this forward-thinking series challenge existing practices in early childhood education and reflect the changing images of the field. The series enables readers to engage with contemporary ideas and practices of alternative perspectives which deviate from those theories traditionally associated with the education of young children and their families. Not only do these books make complex theory accessible, they provide early childhood educators with the tools to ensure their practices are backed by appropriate theoretical framework and strong empirical evidence.